This wonderful, easy to prepare refreshing dip appears often on our table. The cool cucumber, yoghurt and mint combination goes very well served by the side of grilled meats, vegetables and casseroles. Some of the finest yoghurt in the world is made in Turkey. Yogurt is an important feature of the Turkish diet, and is included in some way at most family meal times. Traditional Cacik is not so much a meze but more a chilled yoghurt soup with water and ice cubes added. Made in the traditional way, it is easy to whisk up, and served in a small bowl alongside hot meal dishes, to refresh and cleanse the palette. If you wish, exclude the water and the ice to create a great cooling dip, as I prefer to do here. Combine the yoghurt and garlic and beat until smooth. Stir in chopped cucumber and mint. Add salt to taste, cover and refrigerate until required. Add fresh mint leaves for garnish when serving. Note: Praised for its health-giving qualities, yoghurt is rich in calcium, phosphorus and B vitamins and has earned a reputation as one of the most valuable health foods. The bacteria in live yoghurt are known to stimulate friendly bacteria in the gut easing gastrointestinal problems and aiding digestion. Oo, this looks delicious! I make dips and sauces like this quite a bit, but I usually add minced garlic directly, and only add a pinch of salt as an afterthought if it later seems necessary… I’ll have to try your method of crushing the garlic clove together with salt first! Thanks a lot, hope you enjoy it! merhaba ozlem, i love your cooking manny thanx for you recipe i cant wait to make it ..
Hello Ozlem ! New reader here 😉 !!! All your receipes looks so amazing , thank you very much. Gonna cook some delicious Turkish food for my girlfriend. Im from Sweden, and here we have a lot of immigrants from all over Europe, ecpecially the Balkans, so we have Kebab everywhere. But i must say that its MUCH more delicous when you cook it by yourself. Have a great day, now im gonna eat Bulgur with Chicken and Ozlem’s Cacik Dip ! Is your “thicker” cacik more like Haydari? Or do we not use cucumber in Haydari? Hi Dotty, my cacik dip is really the same thing as cacik minus the water added to it. 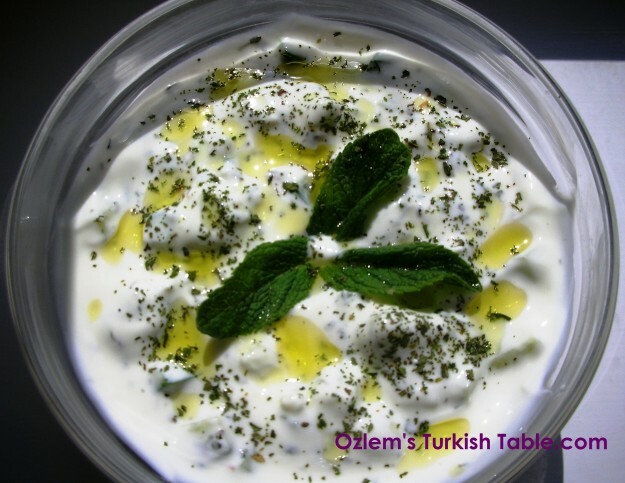 Haydari is made with strained yoghurt, with garlic and sometimes dill and dried mint added to it. Hi Ozlem, I like your recipes. The wonderful thing is, these are very similar to Indian dishes. This yoghurt dip, specially , in Northen part of India is known as RAITA. In summer ,its part of everyday “s meal. Merhaba Amy, many thanks for your note; you are right, we have a lot of similarities with Indian cuisine, one of my favorite cuisines. Love Raita too, it is gorgeous, red onions in it is a nice addition; glad to hear you’re enjoying my recipes.